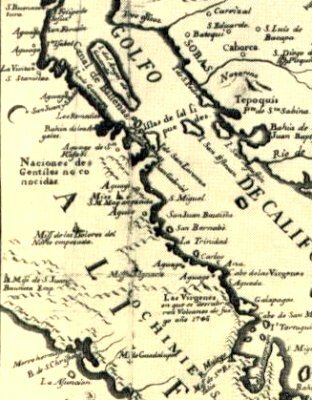 Padre Miguel Venegas created this map from compiled Jesuit documents. The northern half of the map is shown here, and includes six mission sites. Three are known and three may be lost? The second frame has the six missions marked. Near the top is a waterhole called 'Aguaje de Santa Isabel' (between Bahia San Luis Gonzaga and Punta San Fermin). 'Santa Isabel' is also the name of another lost mission believed to be in this part of Baja, a popular Baja legend. 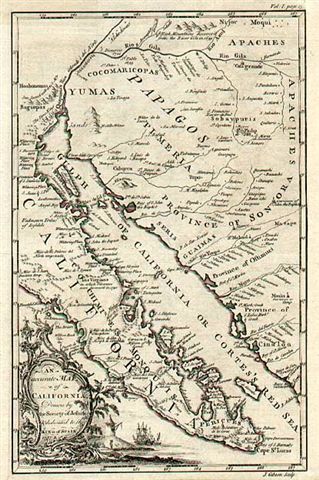 Established: Santa Rosalia de Mulege, Guadalupe, San Ignacio. 'Started': San Juan Bautista, Dolores del Norte, Santa Maria Magdalena. San Juan Bautista was believed to be located in the Sierra Santa Clara, west of San Ignacio and north of Punta Abreojos. Sometimes called the Lost Santa Clara mission, no ruins have been officially discovered. Dolores del Norte (north of San Ignacio) was indeed an early name for the next mission, which became Santa Gertrudis. Some maps and INAH show a seperate mission of Dolores del Norte at the adobe visita ruins of San Pablo. The villagers at San Francisco de la Sierra told Choral Pepper (in 1964) that the old rock walls there were from Mision Dolores (see photo, next page). Perhaps an early site, before being moved north and renamed.